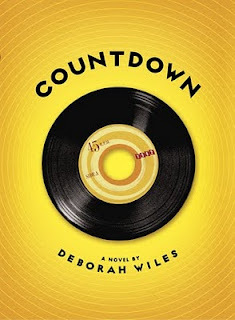 Countdown by Deborah Wiles. Scholastic Press. 2010. Copy provided for review. The Plot: Franny Chapman, eleven, is a fifth grader at Camp Springs Elementary School in October 1962. Her father is a pilot at nearby Andrews Air Force Base. Franny's life is in upheaval. Her great uncle Otts, who lives with the family, is acting weird, almost as if he's back in World War I, and the whole neighborhood knows. Her best friend Margie is treating her like a competitor and enemy. Older sister Jo Ellen, a freshman in college, disappears with new friends and unshared secrets. At school they are taught to "duck and cover" to protect themselves in case of a nuclear attack. It's scary; made scarier when Uncle Otts goes even crazier and tries to turn the front yard into a fallout shelter. Life continues to spin out of control with the news reports that Communist Russia is sending nuclear weapons to Cuba. The Good: Before Chapter One even begins, before Franny informs us that "I am eleven years old, and I am invisible," Wiles immerses us in the world of the early 1960s. Photographs, quotations, advertisements, the price of gas; and most about politics, the Soviet Union, Kennedy, "duck and cover". I was born in 1966; I never had "duck and cover" drills, though we saw the dusty faded Fallout Shelter signs on buildings. By the time I was in school, it was with the knowledge that if we were attacked, we'd all die. Squatting by a wall, pulling a newspaper over you, having canned foods in your basement was not going to save you. So, just like the young reader of Countdown, I don't know first hand about America in the early 60s. Wiles's use of primary documents woven throughout the book creates a "you are there" feel for the book, so when Franny hears the drill we, like Franny, have seen the illustration of how to "duck and cover" when you're outside. This "documentary novel" shows the reader, throughout the book, life in the 60s, life Franny experiences. The careful reader will put together some of the clues, such as the mentions of the Student Nonviolent Coordinating Committee in the documentary sections and then the abbreviation SNCC showing up in the story. The documents do more than show life as of October 1962: the biography of Harry S Truman relates his death in 1972, and President Kennedy's assassination in 1963 is included. While the documents may give a "1962" flavor and depth to the reader, these references acknowledge that the reader, unlike Franny and her friends and family, is in the present. Early in the book, in a short biography of President Truman, the reader is told that Russia was an ally during World War II and an enemy after. Franny's and Margie's friendship reflects this in a personal way; one day they are friends, the next Margie is conspiring against her. When Margie needs Franny's help towards the end of the book, what should Franny do? I loved this book; I'm pretty proud of the fact that I'm not turning this into a gushing "love love love" post (because that wouldn't tell you much about the book, would it?) but instead am discussing interesting parts about Countdown. Other things to love? The disdain and fear that Franny's mother shows the divorced neighbor and her daughter simply because the woman is divorced, reflecting a mindset much different from today. The casual and constant cigarette smoking by Franny's mother. The very familiar non-Julia Child food -- instead of biscuits and cheese, one of Franny's favorite dishes. my family made crescent rolls and cheese and I totally forgot it and how much we loved it until right now. Franny, herself, not quite sure what to do at times. The teacher who repeatedly skips over Franny during the readaloud time at school -- and oh, the resolution of this is so perfect because it is about misunderstandings and lack of communication. Some would say that such misunderstandings and communication were part of the Cuban Missile Crisis. The family, sometimes flawed (like when the mother blames Franny for not being able to stop Uncle Otts from digging up the front lawn, not realizing or accepting she's asking a child to prevent an adult from doing something) but always loving (despite Uncle Otts's outbursts, there is no question that home is where he belongs). What age for this book? Just like the format isn't easy to define, because of the mix of fiction and images, the age isn't simple. Franny herself is in fifth grade, and some fifth graders and younger will like this. Even though some think that readers won't read "down" (so those older than eleven won't read about eleven year olds), I disagree. Given a good story and engaging characters, readers will, well, read. Countdown is a heavy book, literally (no, really, this book just seems to weigh more than other!) and figuratively, with the combination of documents and story, and the parallel story telling, with the countdown to war, the countdown to the end of a friendship, the countdown to changes in life, this will appeal to older readers who want something different. I'd hand this to anyone looking for a good story who welcomes complexity in both storytelling and in characters, and that includes adults. Wiles's website has some yummy extras, including a 1960s songs playlist and the instructional Duck and Cover film that Franny and her classmates are shown in school. I'm adding this to my Favorite Books Read in 2010 (see sidebar for full list). I just read this one too and loved it! I love the format and it really pulled me into the time period. I'm eager to talk to some of my readers at the library and see if I can get them to pick this one up-I want to know what they think of it and if it works as well for them as it did for me. I love this author's other books plus it sounds like great historical fiction. Thanks for your review. I haven't quite finished Countdown, but I'm loving it. I'm also running a giveaway, and posted a link to your review, since I haven't written mine yet. Hope that's ok.
Based on this review I have gotten a copy of COUNTDOWN, and it is next after I finish this rather long (but so informative) biography of Abigail Adams. I enjoyed this one as well. For all the reasons you mention here -- great imagery as well as excellent characters and story. I think Wiles has created a book that can span age and time. I'm looking forward to the next. This sounds good. I've also read some to DW's other books and enjoyed them.